Wash and dry the Lettuce; break into bite‑sized pieces. Prepare the Dressing Mix according to package directions. Sprinkle a teaspoon of Salt in the bottom of a large salad bowl and rub the cut end of a Clove of Garlic in the Salt: be sure to cover the entire bottom) of the bowl. 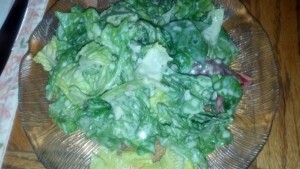 Add the Lettuce pieces to the bowl and toss well to incorporate the Garlic into the Lettuce; toss with the prepared Salad Dressing. If desired, the Anchovy Paste can be eliminated from the dressing and Anchovy Filets can also be substituted.